These designs are all based on a remarkable William Morris tapestry originally designed for his patron Alexander Ionides. Completed in 1887, it measured 15ft (4.5m) wide. Morris delegated the drawing of the animals to the architect Philip Webb and the foreground millefleurs to his eventual successor Henry Dearle. The result is a tribute to their lifelong friendship and various talents. 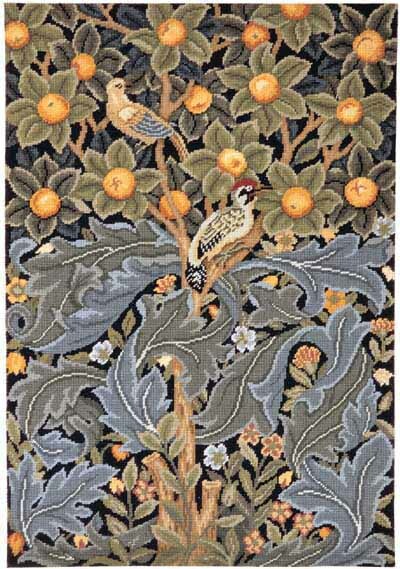 It is interesting to compare the Greenery tapestry designed later entirely by Henry Dearle. The original Forest is owned by the Victoria & Albert Museum. 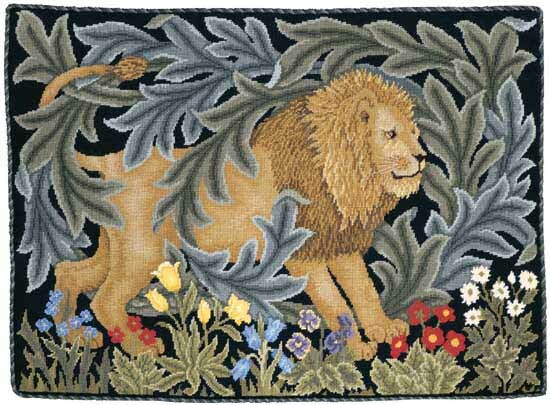 The tapestry has been adapted so that each part of the design is complete in itself. 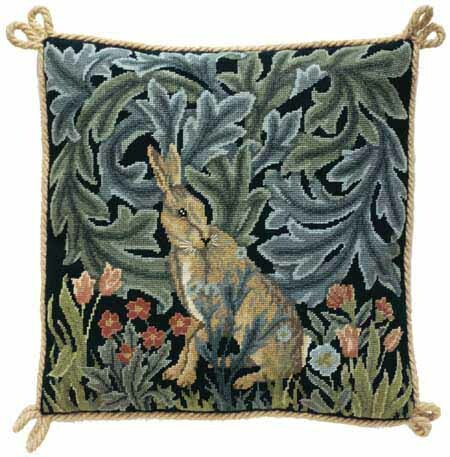 The Hare, Fox and Raven are also available on a single canvas suitable for a piano or fender stool or making a fabulous long wall hanging. 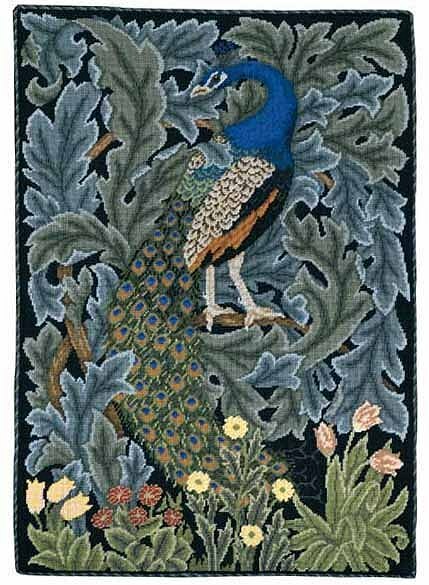 The Peacock is a perfect size for a firescreen with the Lion made into a comfortable fireside cushion. 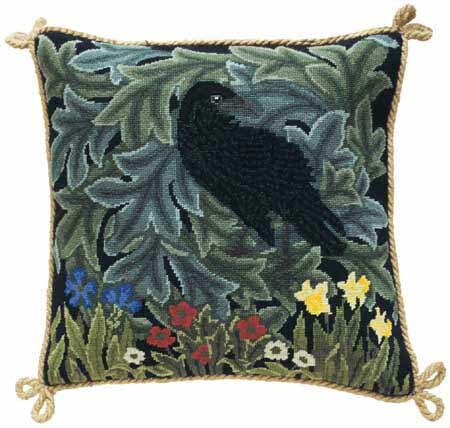 The kit uses Appletons crewel wool on 14hpi canvas and measures 14" (35.5cm) square. The kit uses Appletons crewel wool on 14hpi canvas and measures 17" x 23" (43 x 58.5cm). 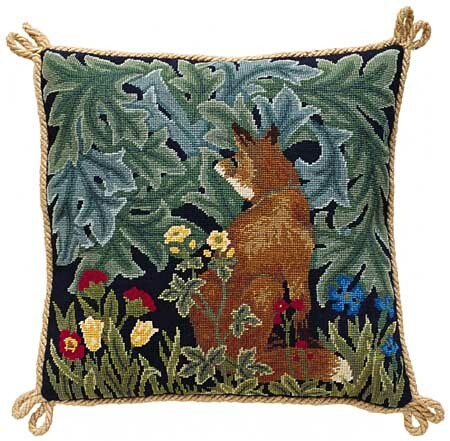 The kit uses Appletons crewel wool on 14hpi canvas and measures 23" x 16" (58.5 x 40.5cm). The kit uses Appletons crewel wool on 14hpi canvas and measures 14" x 42" (36 x 108cm). Overall canvas size 21" x 47" (53 x 119cm).